Seeing your check engine light come on can be frightening, but Road Runner Auto Care in Apple Valley can look at the vehicle to determine what might be wrong. It’s important to find out the reason as to why the light is on as soon as it comes on because the issue will likely progress to an expensive repair. There are quite a few reasons why the light would come on, some being as simple as a gas cap that is loose and some that are more expensive, such as an oxygen sensor. When you take your car to a mechanic in Apple Valley like Road Runner Auto Care, someone will use a small machine that reads the codes that are given by the computer to determine what is wrong. Once the code is seen, this will give a better indication as to the area of the car that needs to be looked at and even the exact issue that triggered the light. A faulty oxygen sensor is among the top reasons as to why the light comes on in most cars. This sensor helps to monitor the amount of fuel that is burned. It can cause a decrease in the gas mileage, which is another sign that you’ll notice if the light comes on at the same time. 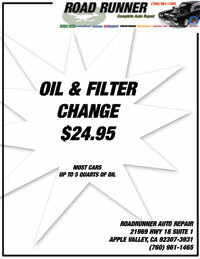 Road Runner Auto Care in Apple Valley also sees issues with the catalytic converter that would make the check engine light come on in a car. This is another component that works with the gas system, converting the carbon monoxide to materials that are harmless. If the converter is failing, then you will see a lack of power in the car and a decrease in gas mileage. Fortunately, with companies like Road Runner Auto Care in Apple Valley, once the reason is detected, the car can quickly be repaired so that you have a safe vehicle to drive.